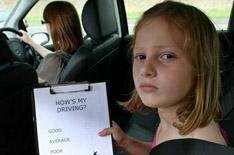 Kids embarrassed by parents' cars | What Car? Forget dodgy fashion choices and 'dad dancing', today's kids are more embarrassed by what and how their parents drive. Two in five say their parents drive 'uncool' cars, according to a poll of 1000 children. Unsurprisingly, most said they want to trade in the family car for a sports car or 4x4. Around one in 10 of four to seven year-olds wants a monster truck. However it's bad behaviour that really makes kids cringe. Two thirds admitted their parents are aggressive drivers and three quarters said their parents shout at other road users. • Almost a quarter had been in an accident with either mum or dad behind the wheel. • One in 10 said they had gripped the seat in response to the speed of their parents' driving.